Intense emotions and feelings: often you want to get rid of them as soon as possible. Even if it works counterproductive and it only worsens the struggle you’re in. It costs a lot of energy to struggle with emotions and feelings. It can induce fretting, sleeping problems, feeling increasingly frightened or depressed, or not feeling comfortable in your own skin in general. In the long term being stuck in emotions can even lead to physical complaints. Therefore, it is important to deal with awkward emotions and feelings in a constructive way. Wondering how you can learn to do so? 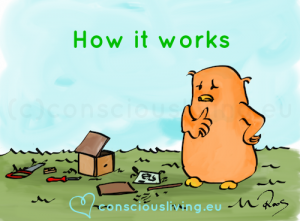 I’m happy to tell you all about it during the online training course ‘Dealing with emotions’. During the online training course Dealing with emotions you gain more insight into emotions and feelings. You learn how they’re naturally connected to other aspects of your human nature, like needs and longings, instincts, thoughts and inspiration. You learn what is needed in order to experience peace in contact with emotions and feelings. And what influence you can exert on it yourself. Combined with the online training course, you can receive additional guidance, individually or with your team. 1. A clear view on who you are: you need to get to know yourself. Who are you and what you do truly need? What keeps you awake at night? How do you deal with intense emotions? What are the underlying motives of your daily actions? Getting to know the ‘real life’ version of yourself, including all the bad habits, tricks and procrastination, gives you direction. 2. The embracement of unwanted visitors: it is necessary for you to (learn to) deal with ‘unwanted visitors’. They are the unexpected physical sensations, pain, emotions, feelings, thoughts or behavioral patters that arise as soon as you relax or sense emotions. 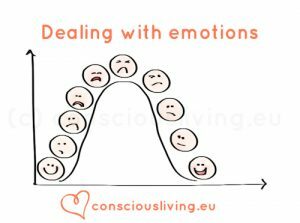 During the Dealing with emotions training course you not only learn why it is important to welcome them, you also learn how to do this yourself, step by step. However, there’s no need for you to start liking the unwanted visitors. In the end, the goal is to no longer chase them away. You learn to develop a mindset and behavioral patterns that help you to endure the visitors. Whenever you’d like to know more about this: in my book The wisdom behind emotion and feeling I explain, on a deeper level, how to naturally deal with emotions and pain. 3. A smart, well-thought-out structure: once you’ve started your inner journey, you sometimes need to be able to hold on to something that guides you through the fog or difficult moments. A structure that you trust. That helps you to move on, without hurrying or skipping steps on the way. An experience-based structure that is composed based on your needs and the experiences of hundreds of people before you. The Dealing with emotions online training course offers you such a structure. It is not always possible to maintain a clear view and simultaneously get to know yourself better. Therefore, it is often pleasant to (partially) let go of control in order to experience. This way you can gain new experiences that support you to grow from the inside out. That’s how you gradually change the way you experience your daily life. 4. Interaction with your teacher and co-students: whenever you run into questions during the online course, it would be useful to be able to ask your teacher. Book one or more individual sessions (using Skype or phone) or join a group training. During guidance sessions and training there is plenty of room for individual alignment, connecting to your unique personal and professional background and answering your questions. It can also be useful to share your experiences with other students as well. Since everyone has a different background, you can learn a lot from each other. Whenever you go through a process of change and inner growth, it is important to (continue to) express what lives inside of you. Sharing experiences is enriching for yourself but also for your co-students and teacher. 5. A notebook to write it all down: whatever it is that you’ve experienced when you deal with emotions, you need to write down your experiences. By doing so, you’re invited to observe what happens. Writing helps to let go of emotions and fears, by acknowledging them and giving them the right to exist. Writing also helps you to move beyond control issues. From the moment that you’ve written down how things have been for you, you’re able to surrender to the next moment without worrying or clinging to it. Your notebook is your external memory. It enables you to live through processes of inner growth and to experience all sorts of unexpected feelings with it. In due time you can re-read your notes and discover patterns that you were previously unaware of. With the Dealing with emotions online training course you can learn and integrate all of this step by step. It helps you to find and maintain inner balance. In a way that supports your personal and professional life. The Dealing with emotions online training course helps you to get started and continue to grow in your own environment. The course has a clear structure and buildup that supports you in gaining skills and insights step by step. With audio, video, do-it-yourself assignments and guided meditations you refine your knowledge and insights. It’s all about learning by doing! The Dealing with emotions online training course is focused on acquiring experience based knowledge, insights and skills. Just like the guidance tracks, the online training courses are suitable for every experience level: I (Wendy van Mieghem) teach in such a way that both beginners and (very) advanced practitioners can make a huge step forward in their development. You receive unlimited acces for your own personal use. As a result, you can follow the online training course at your own pace. You can also repeat it as often as you like. This helps you to deepen your knowledge, insights and skills. Caution: you need an internet or Wi-Fi connection every time you wish to access the ‘Dealing with emotions’ online training course. About dealing with emotions: What are emotions? What are feelings? And what’s the difference between them? Which instincts do you run into when dealing with emotions? This lesson contains an extensive video explaining the ins and outs of dealing with emotions. With a do-it-yourself assignment, reflection questions and a meditation/mindfulness exercise. You become more aware of how you deal with emotions and what this means for you right now. You observe your own motivation. 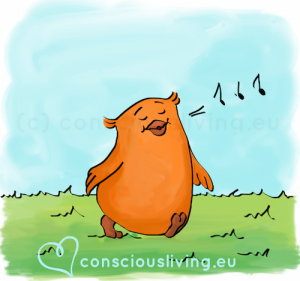 Your human nature: this lesson contains a video about the interaction between instincts, emotions, feelings, thoughts and inspiration. You learn about the difference between destructive and constructive ways of dealing with emotions, about the two roads to happiness and about the importance of alignment and relaxation. With do-it-yourself assignments, reflection questions and a meditation/mindfulness exercise. The wisdom behind emotions and feelings: how do you learn to understand the wisdom behind emotions and feelings? That’s what this lesson is about. We’ll explore what wisdom is and study 3 examples. You learn about the central role of needs and longings in your daily life. And about the connection between change, growth and recovery. With do-it-yourself assignment, reflection questions and a meditation/mindfulness exercise. Interaction in contact: when you wish to learn to deal with emotions and feelings, it is important to learn to make an increasingly refined distinction between what is yours and what belongs to others. From this distinction you need to (learn to) recognize and respect your own boundaries. In this lesson you learn, among other things, which steps you can make in contact with yourself, how the interaction with others develops, what emotional entanglement is, which levels can be distinguished in it, how these levels arise and what you can do to untie the knot. With do it yourself assignments, reflection questions, and meditation/mindfulness exercise. The interim score: take time to reflect on how the online training course is going for you up to now. Learn about frequent pitfalls and their solutions. With do-it-yourself assignment, reflection questions and a meditation/mindfulness exercise. You learn how to deal with impatience, loneliness and resistance. Making space: during this lesson we zoom in on the interaction between emotions and thoughts. We explore the different aspects of thoughts and how they influence the way you deal with emotions and feelings. You learn how you can make more space in your head, in order to sink into your pelvic area, legs and life. With do it yourself assignment, reflection questions and a meditation/mindfulness exercise. Question and answer: this final lesson explains the human question-and-answer mechanism’ and how it works. With the help of 3 examples you develop more insight into this mechanism. Next, you get into it. This last module also contains a do-it-yourself assignment, reflection questions and a meditation/mindfulness exercise. It offers some tips and suggestions on how you can continue the good work you’ve done so far. Students of the online training course are welcome to join the Conscious Living Community: a private Facebook group where you can ask questions and share experiences with other students. 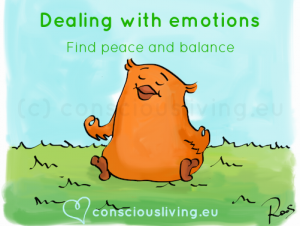 The ‘Dealing with emotions’ online training course is developed by Wendy van Mieghem. She is a psychologist, sociologist and is a European Certified Psychotherapist. From her company Consciousliving.eu she helps companies, teams and individual professionals grow in contact and communication. She’s a specialist in leadership development and change processes. Wendy provides training courses for professionals in English and Dutch. 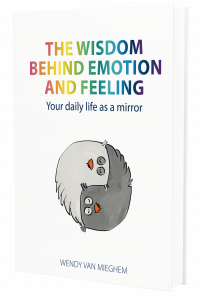 Wendy van Mieghem is author of the book The wisdom behind emotion and feeling – Your daily life as a mirror , an internationally acclaimed conscious living manual. Once you have decided that you want to deepen your insight and skills in dealing with emotions via me, you may want to opt for a guidance track during the purchase or after. You can choose between individual guidance or a group training. 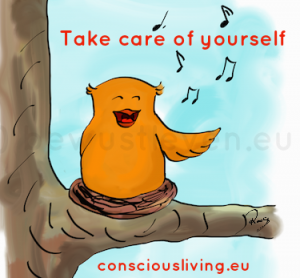 A guidance track offers you all the advantages of live contact: during one hour (individual guidance) or one or several days (group training) I tune in on who you are and what you need to develop yourself fully. When you book an individual guidance session I reserve time for you and it guarantees my presence and full attention. In consultation, you can decide in which way you’d like to use this time. We have contact through Skype, phone or you can visit my office in the Netherlands. When you follow a group training (mostly Incompany, at times open enrollment is also possible), I divide my time in 2 separate days of group training on location. In between the group training sessions you can have an individual contact moment with me via Skype or phone, 2 or 3 times. The online course will be available from May 2019 on. You can find more information about the guidance tracks in the price table below. Or you can contact me. The online course will be available from May 2019 on. Both the online course and the guidance tracks are developed at an academic level (higher educational level or equivalent ability). If you’d like to enroll in the online course ‘Dealing with emotions’ in combination with Individual guidance or a Group training, please send me an email with your name, phone number and a brief description of who you are and why you’d want to join. I’ll contact you within 2 working days so we can arrange the practical aspects. Bear in mind: unless there’s an open enrollment training scheduled in the agenda, a group training is only possible Incompany. After we’ve received your payment, we can get started. You’ll receive a code (‘coupon’) that gives you ‘free’ access to the online course in the webshop. TIP: when you’d like to go through the online course in 14 weeks, I advise you to take 2 weeks for each lesson. Going through each lesson (video, audio, do it yourself assignment, guided meditation) initially takes about one hour of your time. Once you start to repeat a lesson, it can go quicker. Exercise twice a week in order to gain enough experiences. This way you enable yourself to actually acquire the insights and skills that you long for. Of course, you can spend more time going through each lesson before you move on to the next. Attune to what you need and learn at your own pace. 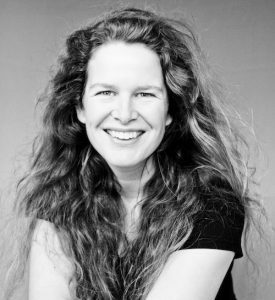 The ownership and copyright of the online course and training both rest entirely with Wendy van Mieghem. It is not allowed to publish, share, copy, duplicate or edit any of the information without explicit written permission from Wendy van Mieghem. Each time you’d like to use an online course, you go to the ‘My account‘ page and you log in with the password and username that you chose during your payment (step 2). Then go to the ‘My courses‘ page. Click on the name of the online course you’d like to work with and you’ll get to the contents of the course. Click on the lesson you’d like to follow. I wish you a sparkling day full of wisdom and new insights.